A black and white large format negative of Sergeant Alfred Samuel Reardon taken on December 6, 1946. He is wearing his dress uniform. Alfred Samuel Reardon was born at Middlesex, England on 16 April 1911 and came to Whitby in 1927. 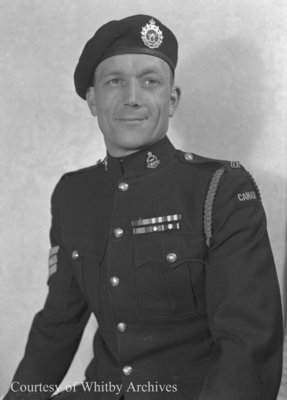 On 24 September 1939, Reardon signed up with the 11th Armoured Regiment in Oshawa and served in Europe for the duration of the Second World War. On returning to Whitby, he opened a show repair business in 1946 but closed it in September 1951 due to ill-health. From 1964 to 1976 Reardon was employed in the laundry and linen service at Whitby Psychiatric Hospital. He died at Whitby on 13 August 1980 and is buried in Groveside Cemetery, Brooklin. Alfred Samuel Reardon, December 6, 1946, Marjorie Ruddy. Whitby Archives A2013_040_633.